The Polynesian, Stock Custom Home’s first project on Marco Island, has been hailed as a resounding success in the new home community. Bringing more than seven decades of building experience, Stock was able to create a home that ushers in a new era of design on Marco through their award-winning team, attention to detail, and their commitment to excellence. This home is the first of three on Marco Stock is working on and its beauty, location, and functionality make it easy to see why it was quickly put under contract. “Our reception on Marco and in the new construction community has been so warm and gracious,” says Lynn Hurley, New Home Sales Consultant with Stock Development. “Life here is all about the water and we have developed a line of homes that matches the island feel people love and are actively seeking.” She also attributes the home’s easy, indoor/outdoor flow to its popularity. This 3,900 square foot, four bedroom, four and a half bath home was built to take advantage of the lot’s location on a canal with direct access to the Gulf of Mexico. Not only is the home the perfect place to entertain, it’s also a great launching point for all your boating dreams. The home’s inviting exterior, created by Southwest Florida Design, is a beautiful blend of West Indies style and classic Florida charm. The home is balanced but not symmetrical, creating a more casual appeal perfect for its island location. Accents like the corbels and louvered awnings over the windows add visual interest and are in keeping with the tropical aesthetic. The lush landscaping that surrounds the house creates the feeling of an oasis and the combination of mature and new trees helps balance this new construction home. Inside, the home is open and breezy. Designer Daniel Kilgore of Soco Interiors chose light colors accented by pops of coral and dusty pink for the main areas of the home. The addition of dark wood finishes through accent pieces like side tables and the entertainment console complement the beams above and enhance the home’s West Indies feel while maintaining a coastal transitional look. Sparkle is added through the metals used in the light fixture above and the coffee table’s driftwood-inspired base. In the dining room, a long table sits under a beautiful vintage-style chandelier with swirling baubles and strings of glass beads in soft coral. The focal point in the dining room is the unique wall panel that brings texture and depth to the room. The kitchen is at the front of the home allowing the main seating areas to be closer to the lanai and pool. This also enabled Stock to create a kitchen with windows. “We’ve gotten away from kitchens against an outside wall with more and more kitchens placed at the center of the home. When you do that you lose that traditional kitchen window and we found people were excited about that simple yet familiar element,” says Hurley. Filled with ample storage, the shaker-style cabinets were designed with oversized drawers. The quartz counters provide a durable work surface. The large island in soft taupe has even more storage via panels that swing open behind the barstools. “The master bedroom was designed to be a true retreat and when people enter the space, it becomes one of the favorite rooms in the house. From the drink station to the placement of the bathroom and closets, this room is so well-planned out and private,” explains Hurley. The closets were placed outside of the main bedroom area for more privacy so someone dressing early in the morning wouldn’t disturb their still-sleeping partner. From the dramatic chandelier to the soft white linens, this room is the perfect island escape. On the second floor, one of two guest bedrooms provides a private space away from the main living areas and the master bedroom. This is perfect for guests or children who are a little older and want their own area in the home. The modern duvet is a colorful accent to the neutral colors in the room. There is also a large loft upstairs for extra entertaining space and to give long-term guests privacy. The lanai offers multiple seating and entertaining areas. The main living space is a fun mix of vibrant orange and resort-style seating options. The fireplace with vibrant blue glass and the feature wall create the perfect outdoor focal point. Beyond, a dining table offers al fresco dining options on the water. The lanai was designed to flow between the main seating area, the grill station, the dining space, and the pool. This creates separation so nothing feels crowded while also allowing for a cohesive entertaining environment. 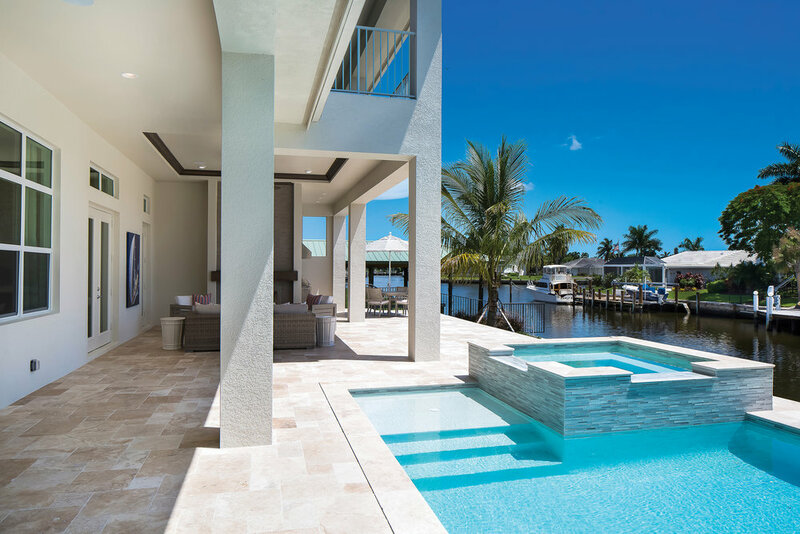 Oversized for the typical Marco Island home, the lanai allows for a nicely-proportioned pool right on the water. The aqua blue glass tiles on the spa and pool are stunning at any angle. Between the interior of the home, pool area, and the location, Stock has created a tropical retreat that invites you to relax and enjoy the laid-back lifestyle Marco Island offers.